I’ve picked a few tomatoes over the last few weeks and now the balance has tipped and lots are ripening all at once. It’s that time of year when I switch from yearning for a juicy, sun-warmed tomato picked fresh from the vine to starting to tear my hair out figuring out how to use them all before fruit flies take over my kitchen! Yes, full-on tomato season has finally arrived at my house and I couldn’t be happier. I have tons of ways that I use tomatoes but here’s a new (to me) idea. I made this soup for a brunch I hosted last weekend. It’s a cold soup and you only barely heat the tomatoes to get the juices to run freely so it retains that beautiful, fresh tomato flavor. Delicious, refreshing and perfect for a warm, August day. The recipe is from Tom’s Big Dinners by Tom Douglas, one of my favorite cookbooks. In the photos you’ll notice a pale green “island” in the soup. 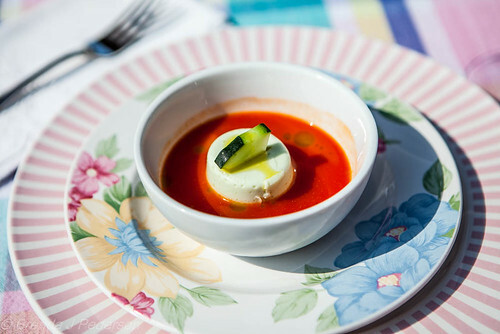 It’s Cucumber Panna Cotta which is part of the recipe as presented in the cookbook. While the panna cotta is good, it didn’t really contrast well enough with the soup, for my taste. So I’m not going to include the recipe for it. Back in 2009 Tom shared the soup recipe on CBS’ The Early Show. At that time he simply served the soup with garlic toast and fresh ricotta. I think that’s a great idea and it’s what I’d do next time! Pour the puree through a fine sieve set over a bowl, pressing on the solids with a rubber spatula to get as much of the tomato through the sieve as possible. Discard the solids. Season the soup to taste with salt and pepper. Allow the soup to cool to room temperature. Strain through a sieve, pressing on the solids with a rubber spatula to extract as much oil as possible. 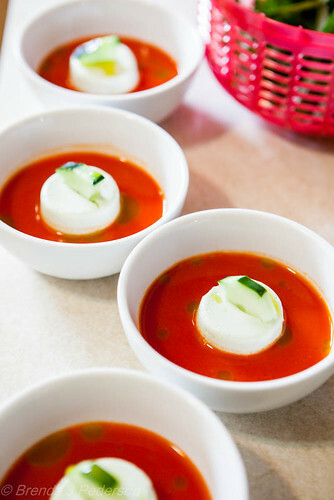 To serve, divide the soup into 8 bowls, then drizzle with the basil oil.